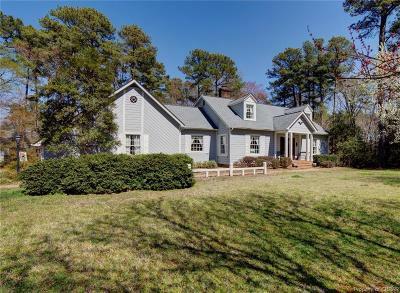 Gracious southern charmer on park-like .93 acre setting in highly sought after Lucy's Cove; a community with dock, swim platform & water access to Moore's Creek & Piankatank River. Spacious easy flowing floor plan starts with Living Room & formal Dining Room joined by double sided masonry gas fireplace, remodeled Kitchen boasting huge walk-in pantry, stainless steel appliances & wine rack, bright Sun Room, 1st floor Master Suite, Mud Room, additional 3 bedrooms, guest bath and 2 full baths. Storage options include huge walk-in attic, attached garage and 2 car detached garage with 2nd floor. This home beams with wonderful appointments including wood floors, butler's pantry, Rinnae tankless water heater, walk-in closets, architectural shingle roof, adorable cupola with copper roof & private rear deck overlooking wide variety of flowering trees, shrubs & plants. Convenient location near marinas, community pool, tennis courts, seafood festival, shops & restaurants. Directions: Rt. 33e Deltaville, Right Providence, Right Sandy Bottom, Left On Waterwich Lane.